It’s been a bit of a weather rollercoaster in Malmö lately with some days feeling more like early fall than July. Yet another rainy day seemed to call for soup. Fisksoppa (fish soup) is common on menus in Sweden and I’ve ordered several tomato-based versions that are really lovely and I was anxious to try making one at home. I pulled out my copy of Vår Kokbok, Sweden’s answer to The Joy of Cooking, and didn’t quite find a recipe I was hoping for so I looked over the various options and combined my favorite bits into this version. The result is a flavorful, light fish soup that is suitable for summer. If you have your own homemade fish stock, you could use that in place of the water and skip the bullion cubes and simmering the shrimp shells. You could also skip simmering the shells if you are short on time and use pre-shelled shrimp or pre-cooked shrimp instead. Salmon could be used as an alternative to cod. Bring the water to a low boil in a 4 quart pot. While the water is heating, peel the shrimp and put the reserved shells into the pot. Simmer the shells covered for 10-15 minutes. Strain the liquid through cheesecloth. Discard the shells and add enough water to equal one liter of liquid. Return two cups of the shrimp liquid to the pot and bring to a boil. Steam the mussels in the covered pot until they open. Check them frequently after three minutes and transfer opened mussels to a bowl. Discard any mussels that remain unopened after 10 minutes. Check the broth for sand and strain or decant if necessary. Combine the liquid with the rest of the reserved shrimp shell broth. Melt the butter in a medium saute pan and cook the leek, carrots, and celery over medium-high heat, stirring often, until carrots are crisp-tender, 5-10 minutes. Add the pressed garlic and stir until fragrant, about 30 seconds. Add the crushed tomatoes and stir well. Combine the vegetable mixture and bullion cubes with the reserved broth. Bring to a simmer and add the fish and shrimp stirring gently so the fish doesn’t break up too much. Cook for about three minutes, stirring gently, until the fish is nearly cooked through. Return the mussels and any accumulated juices to the pot, stirring gently, until just heated through. 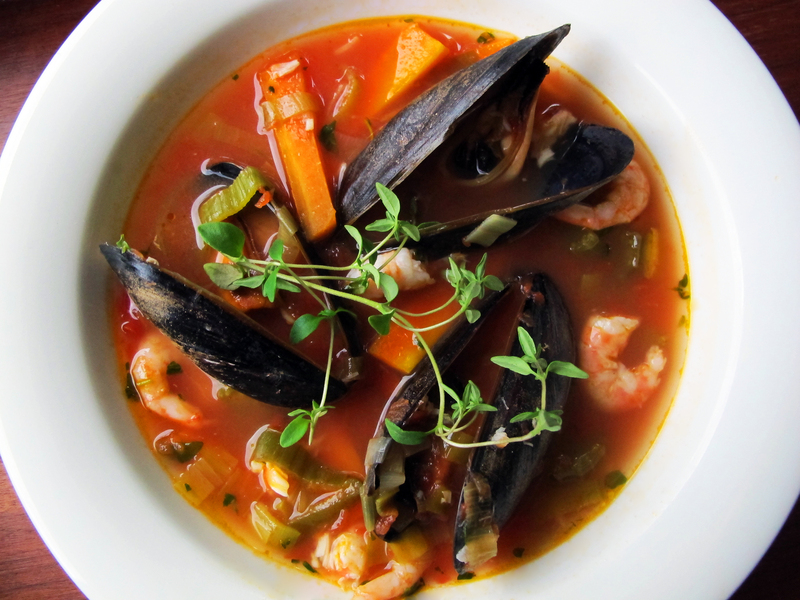 Serve with crusty french bread to soak up the flavorful broth. This sounds really really good. I love fish soup. We will have to try this one out for sure. Thanks Maia.